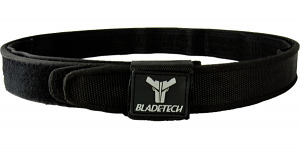 Blade-Tech Competition Speed Belt - 34"
The Blade-Tech Competition Speed Belt provides for a very stable system for your competition holsters and mag pouches. The inner belt loops through your belt loops on your pants while the outer belt attaches to the inner belt holding your holster and mag pouches securely and readily accessible. The dual belt system allows for quick and easy on/off capability for your gear, thereby eliminating the constant shifting of your gear and ensuring it remains in the same place. Order one size up from your waist size. 34" belt.